Warning: Spoilers ahead for Green Lantern #18, on sale today. 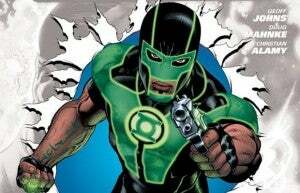 Back when Simon Baz, the newest Earth-based Green Lantern, was introduced, fans and the press roundly mocked his decision to carry a gun in spite of the fact that the Green Lantern ring was, in fact, the most powerful weapon in the universe. 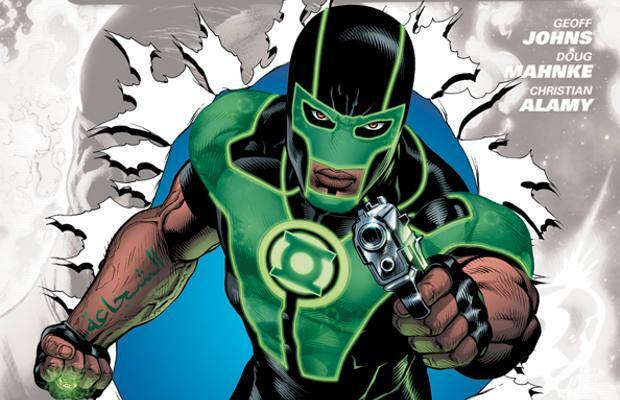 Some saw it as borderline racist, the image of a man of color wearing a full-face mask and brandishing a gun when the character at the center of Green Lantern stories has never done that before. Some saw it as trying to make the character more "extreme." Most just thought it was silly and unnecessary. Well, as it turns out, writer Geoff Johns has had a plan for that gun all along. While Hal Jordan and Sinestro had planned to make their way out of the "Dead Zone" together, Sinestro can't resist the urge to try and pull a fast one, attacking Baz in the hopes of taking his ring away from hi and using it to escape. Hal Jordan (and Baz himself, more likely than not) would be left behind while Sinestro would be allowed to return to the land of the living. All seemed to be going more or less according to plan, as Sinestro--vastly more experienced in the ways of power rings than is Baz, was wrestling the ring away from the inexperienced Lantern. 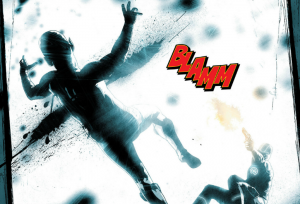 Then, to the surprise of both Sinestro and Jordan...a gun went off (see right).